Is Golden Ratio's association with perceived beauty a myth? Many people advocate using the Golden Ratio in design (e.g. logo design). Is the Golden Ratio's purported aesthetic appeal supported by scientific evidence? Recent reviews of the empirical literature bearing on the claim of special aesthetic significance for this ratio in the context of the perception of simple figures include Green (1995), Hoge (1995), and contributors to a dedicated edition of Empirical Studies of the Arts (Hoge 1997). Some investigators doubt that the golden section has any aesthetic significance, even suggesting that research on it be abandoned (Boselie 1992, 1997; Davis and Jahnke 1991). Others prefer to leave the question open, especially in view of the methodological difficulties associated with testing the significance of the golden section (Green 1995). Green (1995) argues that "[t]here seems to be, in fact, real psychological effects associated with the golden section, but they are relatively sensitive to careless methodological practices." Russel (2000) explored the height to width ratio of a large database of famous paintings and did not find any particular support for a preference for the golden-section. Russel suggests that in the real world functional factors tend to constrain ratios. McManus (1980, PDF) provides an interesting discussion of the methodological issues and the findings of research that has empirically studied aesthetic judgements of simple figures. McManus advocates the use of the paired-comparison method whereby participants make aesthetic judgements on which of series of pairs of objects is more aesthetically attractive. McManus observed that there were substantial individual differences in such preferences. McManus felt that existing empirical research was unable to adequately differentiate preference for the golden-section versus other similar ratios such as 1.5, 1.6 or 1.75. Boselie F, 1992. "The golden section has no special aesthetic attractivity!" Empirical Studies of the Arts 10 1-18. Boselie F, 1997 "The golden section and the shape of objects" Empirical Studies of the Arts 15 131-141. Hoge H, 1995 "Fechner's experimental aesthetics and the golden section hypothesis today" Empirical Studies of the Arts 13 131-148. Russell, P.A. (2000). Testing the aesthetic significance of the golden-section rectangle. PERCEPTION-LONDON-, 29, 1413-1422.
the sense of beauty is mediated by two non-mutually exclusive processes: one based on a joint activation of sets of cortical neurons, triggered by parameters intrinsic to the stimuli, and the insula (objective beauty); the other based on the activation of the amygdala, driven by one's own emotional experiences (subjective beauty). (...) in conclusion, both objective and subjective factors intervene in determining our appreciation of an artwork. Therefore, the presence of the golden ratio in the sculpture determined brain activations different to those where this parameter was violated. It's quite interesting result that indirectly supports the association between positive aesthetic perception and the presence of golden ratio. 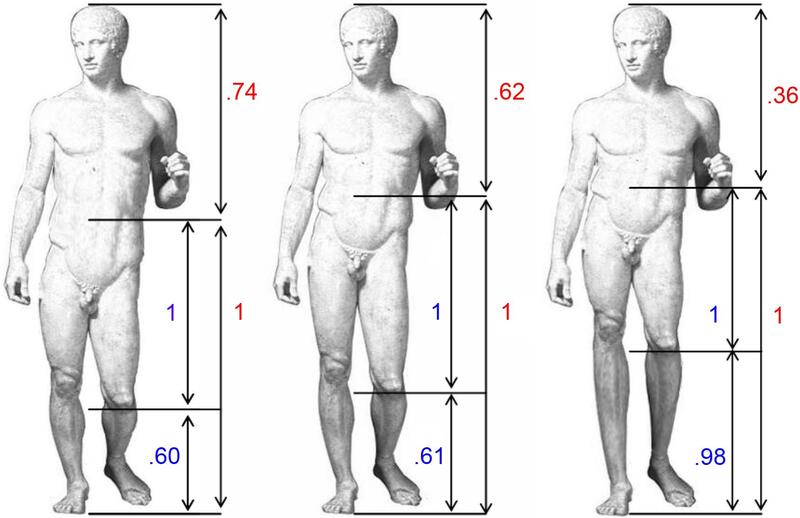 other answers are helpful but what is missing from them so far is that there seems to be basic golden ratios built into the natural human body proportions eg relative dimensions of body parts, including esp in the face dimensions, which is highly oriented with perception of beauty (but dont have an immediate authoritative/scientific ref for this). not sure but possibly DaVinci was interested in this connection eg in the iconic Vitruvian Man diagram but whether DaVinci used the golden ratio intentionally is subject to intense scholarly debate. it is possible that his artwork was just so lifelike that it naturally mimicked the golden ratio in natural human proportions. it is natural to speculate whether these proportions emerged from maybe evolutionary constraints, or some kind of feedback loop between psychology and biology ala evolutionary psychology. but in any case the golden ratio has emerged in many other biological organism morphology/dimensions, so it is not outlandish to observe it naturally evolving in humans also. Not the answer you're looking for? Browse other questions tagged perception aesthetics or ask your own question. What is the consensus on the Golden Rectangle? Why is white on black considered higher contrast than black on white? To what extent do individuals vary in their ability to mentally visualise? Is there evidence for a unique isolated internal representation of loved ones? Do unequal step sizes in staircase procedure affect the convergence? Is V1 involved in visual imagery?